Self-harm stems from pain so deep it feels as if there is no other way to take away the emotional pain. Whether you have been abused, hurt, rejected, abandoned, or anything else that has caused you emotional trauma and you have turned to self-harm to cope…we are here for you. If you feel like you are alone in your struggles with self-harm…we are here for you. If you feel that you don’t know where to go to get help…we are here for you. If you feel that you are past the point of getting help…that simply isn’t true…we are here for you. Be encouraged by these girls that have battled (and still do) with cutting and self-harm but have found help and support through their struggle. 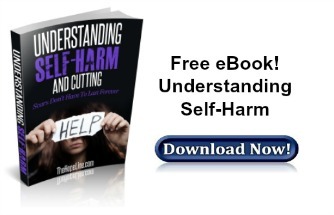 If you struggle with self-harm and want help, check out TheHopeLine’s eBook.